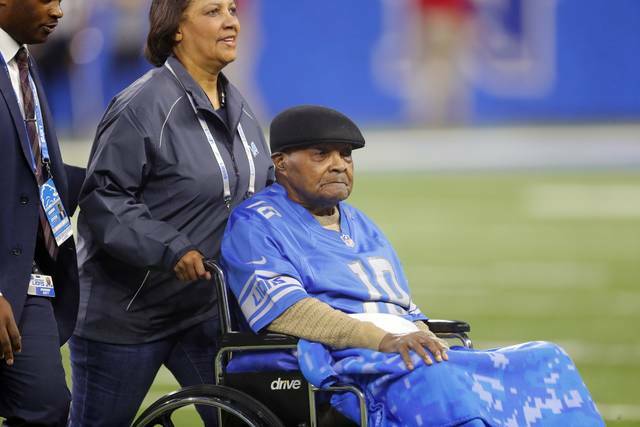 DETROIT (AP) — Wally Triplett, the trailblazing running back who was one of the first African-Americans drafted by an NFL team, has died. He was 92. The Detroit Lions and Penn State announced Triplett’s death Thursday. 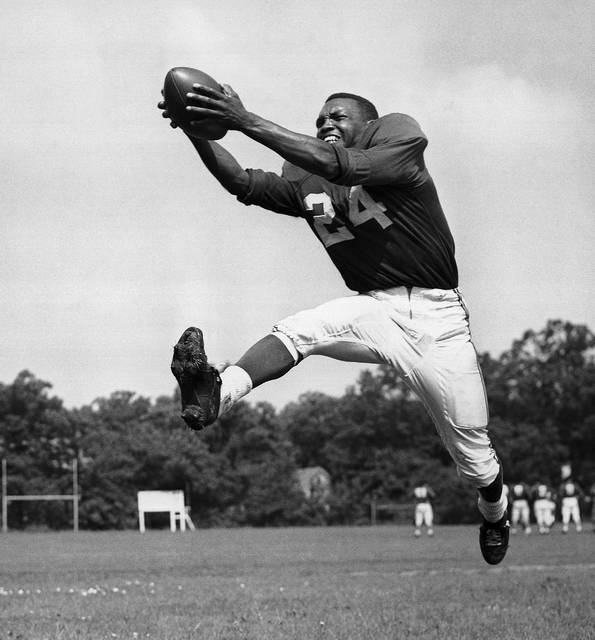 Triplett was the third African-American selected in the 1949 draft, but he was the first of those draftees to play in a regular-season game. He played in 24 games for the Lions and Chicago Cardinals. 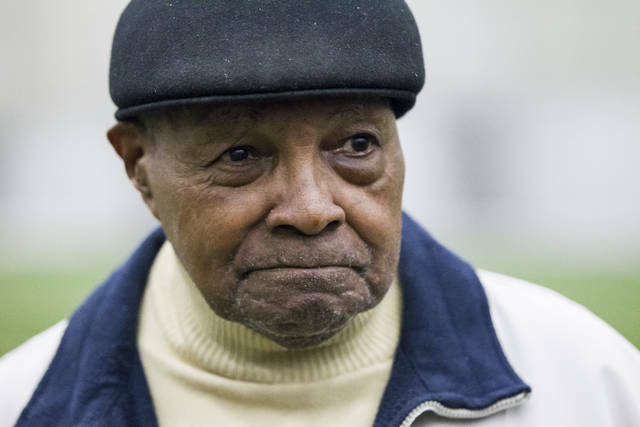 Triplett was also the first African-American to start for Penn State, and in 1948, he and teammate Dennie Hoggard became the first African-Americans to play in the Cotton Bowl . Triplett was inducted into the Cotton Bowl Hall of Fame this year, and his appearance in that game is part of Penn State lore. According to the school, the team was asked to consider the possibility of leaving Triplett and Hoggard at home for the game in then-segregated Dallas. Teammates responded by saying: “We are Penn State, there will be no meetings” — a reference to a previous Penn State team that voted to cancel a game at segregated Miami. The story remains an important part of Penn State history, especially given the school’s well-known “We Are” moniker. Triplett was drafted by the Lions in the 19th round in 1949. He played in 18 games for Detroit from 1949-50. On Oct. 29, 1950, against the Los Angeles Rams, he had 294 yards on four kickoff returns, an NFL record that lasted until 1994. George Taliaferro was the first black player drafted in the NFL when he went six rounds before Triplett in 1949. Taliaferro also died recently . METAIRIE, La. (AP) — Dez Bryant has found a new team, agreeing to join the already prolific offense of the surging New Orleans Saints. The former Dallas Cowboys wide receiver, who has been looking for an NFL home since becoming a free agent in April, will now have a chance to catch passes from one of the most prolific quarterbacks in NFL history in New Orleans’ Drew Brees. The 30-year-old Bryant and the Saints agreed to contract terms on Wednesday, and it remains unclear to what extent Bryant will play when New Orleans visits Cincinnati on Sunday. Bryant spent his first eight years in the NFL with Dallas and last season caught 69 passes for 838 yards and six touchdowns, including a 50-yard scoring play, for the Cowboys. However, his professional reputation has been marred at times by public confrontations with coaches and teammates during games and practices. Veteran Saints tight end Ben Watson said players in New Orleans’ locker room must guard against pre-judging Bryant based on superficial observations from old television clips without knowing all the facts or how Bryant has evolved personally since. Seeking salary cap relief, the Cowboys released Bryant after last season with two years remaining on the receiver’s five-year, $70 million contract. Last season was Bryant’s best since he caught 88 passes for 1,320 yards and 16 TDs in 2014, which at the time was his third consecutive season with at least 1,200 yards receiving. He signed his last Cowboys contract right after that, but has not approached that level of production since — a central reason Dallas released him in April. “What matters is, what are we going to do for the next eight games?” said Watson, who played for the Patriots when running back Corey Dillon arrived with a reputation as a malcontent from Cincinnati in 2004 and helped New England win a Super Bowl. Watson was still with the Patriots in 2007 when they added another perceived malcontent in receiver Randy Moss, who caught 23 of Tom Brady’s NFL-record 50 TD passes that season. Bryant was among several receivers to work out for the Saints on Tuesday. He’d previously met with Cleveland and Baltimore. New Orleans (7-1), which has won seven straight and leads the NFC South, didn’t necessarily need another receiver. Led by the record-setting Brees, the Saints rank seventh on offense overall, averaging 402.2 yards per game, and seventh in passing, averaging 289.9 yards. At the same time, New Orleans is without deep threat Ted Ginn Jr., who is currently on injured reserve and won’t be eligible to return until the final few weeks of the season, if he’s ready by then. The Saints also have yet to receive consistent production from Cameron Meredith, a former Chicago receiving leader who was acquired in free agency, but who also is trying to come back from major knee surgery that wiped out his 2017 season. Bryant’s return to the NFL with the Saints means he could play against his former club in a few weeks. The Saints play at Dallas on Nov. 29. New Orleans also has two games remaining against division rival Carolina (6-2). AP Sports Writer Schuyler Dixon in Dallas and Steve Reed in Charlotte, North Carolina, contributed. CARLSBAD, Calif. (AP) — Months before the start of spring training, the New York Yankees’ injury list is lengthening. Catcher Gary Sanchez will have surgery on his left shoulder in the next week, which could slow him during spring training but is not likely to keep him out of the lineup on opening day. Cashman made the announcement at the general managers’ meetings, hours after the Yankees finalized an $8 million, one-year contract with CC Sabathia. The 38-year-old left-hander said 2019 will be his final season. New York announced last month that Didi Gregorius will miss much of next season after Tommy John surgery to repair a torn ligament in the shortstop’s right elbow. An All-Star in 2017 who slumped badly this year, Sanchez felt continued shoulder pain while working out last week at the Yankees’ minor league complex in Tampa, Florida, with strength and conditioning coach Matt Krause. Cashman said head team physician Dr. Christopher Ahmad will perform a debridement to remove loose debris from Sanchez’s non-throwing shoulder. The recovery is expected to be about three months. Sanchez, 25, hit .299 with 20 homers and 42 RBIs two years ago, when he impressed during a call-up in the season’s final two months, and he was an All-Star in 2017 who hit .278 with 33 homers and 90 RBIs in 122 games. But he slumped to a .186 with 18 homers and 53 RBIs in 89 games this year, when he was limited by a groin injury, and his defense was poor for the second straight year. “It may very well have been something that affected him performance-wise. I can’t rule that out,” Cashman said. Sabathia went 9-7 with a 3.65 ERA in 29 starts this year. He met with Cashman in the Yankees clubhouse the day after New York’s season ended. A six-time All-Star and the 2007 AL Cy Young Award winner, Sabathia is 246-153 in 18 major league seasons with a 3.70 ERA and 2,986 strikeouts, including 129-80 in a decade with the Yankees. He took a $2 million paycut. CHARLOTTE, N.C. (AP) — Kevin Harvick’s bid for a second NASCAR title suffered a massive setback when he was stripped of his berth in the championship race after series inspectors found his winning car from Texas Motor Speedway had been deliberately altered to give him a performance advantage. NASCAR said Wednesday night it believes Harvick’s spoiler was intentionally offset to the right to give the Ford an aerodynamic advantage when he drove through the corners at Texas. NASCAR can’t prove if Stewart-Haas Racing made its own spoiler or altered one from its manufacturer, but senior vice president of competition Scott Miller said the penalty is the same in either case. The illegal spoiler was not found until the No. 4 Ford received a thorough inspection at NASCAR’s Research and Development Center when it was returned to North Carolina after Sunday’s race. An inspector at Texas thought the spoiler looked off, but Miller said it had to be removed from the car. Once that happened, it was “100 percent, as black and white as it gets,” Miller said. Spoilers will be checked at Phoenix this weekend, Miller said, and NASCAR will likely ramp up its penalties next year. The whopping penalty negated the automatic berth Harvick earned into NASCAR’s version of a final four. In addition to losing his spot in next weekend’s finale at Homestead-Miami Speedway, Harvick must also close out the final two races of the season without crew chief Rodney Childers and car chief Robert Smith. Both were suspended for two races. Childers also was fined $75,000. Harvick was docked 40 driver points, and Stewart-Haas Racing was docked 40 owner points as well. Harvick enters this weekend’s race at Phoenix fourth among the remaining eight playoff drivers, three points above the cutline. Should there be a tie for the final transfer spot, Harvick would not be eligible to use the Texas victory in the tiebreaking procedure. Greg Zipadelli, vice president of competition at SHR, said the team will not appeal the penalties. Tony Gibson will be Harvick’s interim crew chief and Nick DeFazio will be interim car chief. Harvick’s win at Texas was his series-leading eighth of the year and qualified him for Homestead along with Joey Logano. Now, three spots in the finale will be up for grabs Sunday in Phoenix. Harvick won the 2014 Cup Series championship and went to Phoenix that season in a must-win situation to race for the title. He pulled it off and is a nine-time winner at Phoenix, including earlier this year. Harvick has been in NASCAR’s finale three of the last four years. The penalty is disastrous for SHR, which went into the third round of the playoffs with all four of its drivers eligible for the championship. Logano grabbed the first spot, which meant the best SHR could do was qualify three cars for Homestead. Now, SHR could wind up locked out of the finale outright if Harvick doesn’t advance past Phoenix. Aric Almirola, Kurt Busch and Clint Bowyer are all below the cutline and likely need to win at Phoenix to advance. The penalty against Harvick also closes a rough race for NASCAR, which erroneously penalized Jimmie Johnson moments before the race began. Johnson was sent to the back of the field because NASCAR believed his car failed inspection three times, but he had failed only twice. NASCAR announced the mistake during the race and said Monday it has updated its procedures to prevent a similar mistake moving forward. Later in the same event, Bowyer was penalized for a crew member being over the pit road wall too early. The crew member was sitting on the wall with his feet touching the asphalt on pit road, which was a violation, even if it seemed extreme. Now Harvick’s team has been rocked by a penalty that may change the composition of the final four drivers racing for the title. Harvick, along with Kyle Busch and Martin Truex Jr., is part of NASCAR’s so-called Big Three that dominated the season through a stretch of summer racing. All three were expected to race for the championship, and none is qualified for Homestead yet with one race remaining. NASCAR later allowed Miller to answer questions about Harvick’s penalty because of the magnitude of the situation. NASCAR had moved away in recent years from detailing infractions publicly. Also Wednesday, NASCAR penalized the teams of Ryan Blaney and Erik Jones, who already have been eliminated from the playoffs. Blaney crew chief Jeremy Bullins was fined $50,000, and car chief Kirk Almquist was suspended for the next two races. Jones crew chief Chris Gayle was fined $50,000 and car chief Jason Overstreet was suspended the next two races. It took until Wednesday for the penalties to be announced because the cars were in transit Monday from Texas to North Carolina. Inspection was on Tuesday, and the teams do the actual teardown themselves. Once the Harvick violation was discovered late Tuesday, NASCAR had to examine whether the violation was correct and didn’t release its findings until the next day — two days before Harvick and his interim crew chief and car chief will practice at Phoenix. AVONDALE, Ariz. (AP) — Kevin Harvick’s crew chief says Stewart-Haas Racing modified the spoiler on Harvick’s car because other teams were already doing similar alterations. Rodney Childers is suspended for the final two races of the season and working at the race shop in North Carolina as Harvick tries to overcome a devastating penalty issued this week for what NASCAR determined was a blatant case of cheating. Harvick won last weekend at Texas. When the spoiler was removed from his No. 4 Ford during an extensive inspection in North Carolina, NASCAR discovered the part had been altered. It is NASCAR’s belief that SHR built its own spoiler and tried to pass it off as one distributed by the vendor. The spoiler was offset to the right and NASCAR says it gave Harvick an aerodynamic advantage. Childers elaborated in a series of tweets early Friday morning in which he said SHR made the decision to move the spoiler after other teams shifted their decklids and spoilers to the right in the previous 1.5-mile race at Kansas Speedway. Childers said it was too late for the team to move the decklid for the Texas race. “This year there isn’t a number or officiating on the offset of the decklid and spoiler together on the car. And at Kansas we noticed people we were racing had the spoilers and decklids further to the right than ours. And it was too late to move the decklid over more,” Childers posted on Twitter. He also said there were no hard feelings between NASCAR and SHR, which has all four of its drivers still eligible for the playoffs and has been the most dominant organization in NASCAR all season. Harvick leads the series with eight victories, but two were with illegal cars. His Las Vegas victory from earlier this year was disqualified, as was last week’s Texas win. That disqualification cost Harvick his automatic berth into next weekend’s championship race and Childers and car chief Robert Smith are suspended. Harvick is still mathematically in contention to advance into the final four and he’s a nine-time winner at Phoenix, site of Sunday’s final championship-qualifying event. He won at Phoenix earlier this year. Harvick, the 2014 champion, had no scheduled media availability at ISM Raceway outside of Phoenix as of Friday morning. SHR has declined to make any team officials available for comment. But Joey Logano, the only driver already locked into next week’s title race, was not bothered by the accusations against Harvick’s team. He also said he’s not wondering if SHR, or others, have been cheating all year. Logano missed the playoffs last year because his only victory of the season was disqualified when his car failed inspection. That infraction at Richmond in the ninth race of the season haunted Logano’s team the entire season. He’s not expecting the fallout from the SHR penalty to slow Harvick, who typically elevates his game during times of crisis. Harvick’s 2014 championship season was marked by two different incidents during his title run: He created a wreck at Talladega Superspeedway to save a bad race, and he shoved Brad Keselowski into a scrum to trigger a melee between Keselowski, Jeff Gordon and their crews. The next week, facing elimination if he didn’t win at Phoenix, Harvick dominated the race and advanced into the championship finale. He won at Homestead to claim his first Cup title the next week. Harvick was runner-up the next season and is trying to requalify for the finale for the fourth time in five years. Logano thinks Harvick will be steady this weekend and the biggest deficit the team is facing is not having Childers at the track to lead the team. Childers is banned from the garage but can be in communication with his crew. He said on Twitter he plans on putting in 14-hour work days at the North Carolina shop this weekend. It is possible he could be on property at Homestead-Miami Speedway for the finale. “I think if there is going to be a hiccup, it’s not gonna be on Kevin’s part,” Logano said. “I think Kevin is the type of driver that rises to the occasion. There can be a hiccup in communication. Obviously, they’ll be in communication with Rodney … but it’s not going to be very quick. You know the way things get lost in translation sometimes on the phone compared to being face-to-face.